By Audrey Golden. Feb 8, 2018. 9:00 AM. If you’re interested in learning more about Irish independence and also love graphic novels, we have some exciting book recommendations for you. Gerry Hunt, an Irish artist, writer, and cartoonist who founded Dublin Comics, created a series of graphic novels depicting the Easter Rising of 1916 and the subsequent fight for independence from Britain. Have we piqued your interest? Let us tell you more. Hunt first became known to audiences through his graphic works In Dublin City and The Streets of Dublin. The latter was part of an exhibition, “Artist’s Books,” at the Museum of Contemporary Art in Chicago. Prior to turning to comics and graphic novels, Hunt worked as an architect for 25 years. In 1986, he started creating comics. In 2012, the Irish Literary Academy short-listed Gerry’s At War With the Empire for the Irish Book Awards: Best Irish-Published Book. His political graphic novels have been published by the O’Brien Press, which describes itself as “Ireland’s leading general publisher of both adult and children’s books.” The press has titles across many different genres, from art and fiction to travel and cookbooks. We want to focus on two of Hunt’s political graphic novels from the O’Brien Press. 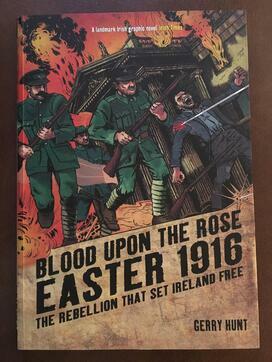 In 2010, Hunt published his first overtly political graphic novel, Blood Upon the Rose: Easter 1916: The Rebellion that Set Ireland Free. For those readers who don’t yet have a strong grasp of twentieth-century Irish history, we’ll tell you a little bit about the moment this text depicts. The Easter Rising, or the Easter Rebellion, occurred in April 1916 during Easter Week. In an attempt to end British colonization and rule in Ireland, a group of freedom fighters planned the uprising and issued a “Proclamation of the Republic.” The Rising lasted for six days. Although the rebellion lasted for less than a week, the desire and attempt to establish an Irish republic echoed in the coming years and throughout Ireland in the twentieth century. Members of the Irish Republican Brotherhood (IRB), the Irish Citizen Army, and the Irish Volunteers made up the majority of the groups who participated in the Rising. The original seven men of the IRB council who signed the Proclamation of the Republic were arrested and executed. It is primarily their stories, as well as the narratives of nearly a dozen other men, that Blood Upon the Rose depicts. 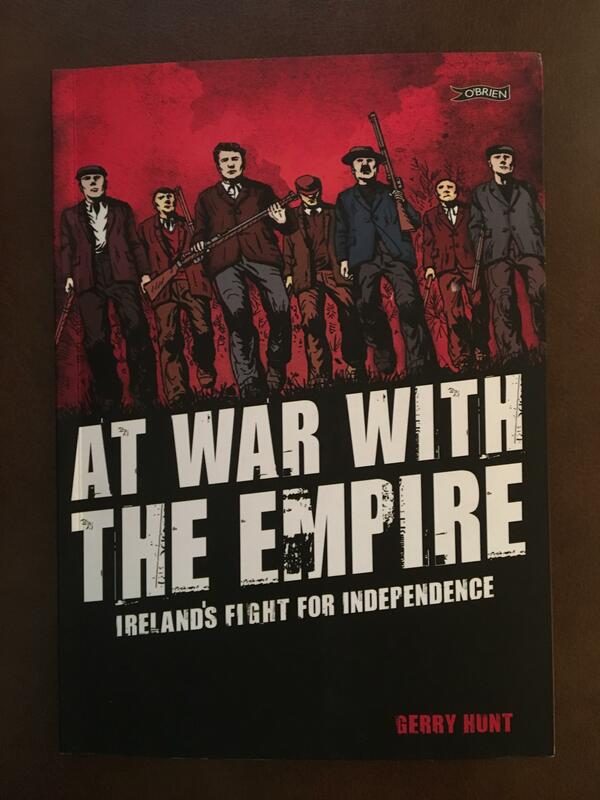 Two years later, Hunt published a second political graphic novel, At War With the Empire: Ireland's Fight for Independence (2012). Starting where Blood Upon the Rose leaves off, this text begins with a group of Irish volunteers imprisoned after the Easter Rising. This text depicts events between 1919-1921, ending with the signing of The Treaty and a partitioning of Ireland. As soon as we learned about Hunt’s graphic novels, we became excited to share them with others. While they’re printed in Dublin by the O’Brien Press, they’re readily available to readers in the U.S. and should be of interest to adults and children alike.